Otto Stürcke will conduct a pastel demonstration at the Monday April 15, 2019 meeting of the Santa Clarita Artists Association (SCAA). This event is free, open to the public and meets at 6:30 pm at Barnes & Noble, 23630 Valencia Blvd. As a representational artist, Stürcke seeks to find common ground between the contemporary and the classical. “I am greatly influenced by the Dutch Masters and aim to depict the personal, the emotional, and the quiet elegance in my paintings through light, shadow, and texture,” said Stürcke. Primarily self-taught, Stürcke joined the U.S. Marine Corps in hopes of attaining financial aid to attend an art college. His plans were altered in 1991 when he was called to serve in Desert Storm. Soon after his military service, he enrolled in art workshops and courses at several local art associations and colleges while launching his illustration career under the mentorship of Mike Butkus. Working as an illustrator served him for honing many techniques and found pastels to be his principal medium of choice. 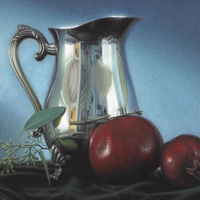 In recent years, Stürcke has garnered recognition and awards for his works including the title of Master Pastelist by the Pastel Society of America, 1st Place in Pastel Journal’s 19th Annual Pastel 100 Competition Animal/Wildlife Category, 1st Place in the 8th Annual Members Show of the Pastel Society of Southern California, Stabilo Award at the 1st International Pastel Exhibition in Rome, Butler Institute of American Art Selection, the Robert & Patricia Suggs Award by the Pastel Society of the West Coast, the ‘Best of 2012’ by Art Los Angeles magazine, and has also been chosen to be part of the American Latino Collective at the Smithsonian Museum. His work has been published in the French publication ‘40 Maitres du Pastel’ (40 Masters of Pastel) by “Pratique des Arts’ magazine, ‘The Art of Chalk’ by Tracy Lee Stum, and as ‘Artist of Note’ by ‘Southwest Art’ magazine. See: https://sturckestudio.com.